Better World Books offers the lowest shipping rates on the Web: free shipping in the USA, and $2.97 shipping worldwide. They can offer these great rates because, unlike most other online used booksellers, they have all of their used books physically in stock. At any one time, around 2 million books are on the shelves of their Indiana warehouse.They are an online-only bookseller, and provide outstanding customer service. $1 cash back on completed Buyback contracts. 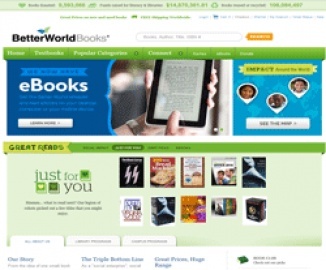 Click a Coupon or click Start Shopping to earn 4% Cash Back at Better World Books.